Photo credit: Raul Del Rosario/ADB. Since the 1990s, manufacturing in the People's Republic of China (PRC) encountered several rounds of excess production capacity. To address this issue, the government has taken a series of measures over time in the areas of administrative management, industrial development policies, environmental regulations, and monetary policies. During 2007-2013, managing excess capacity was flagged as one of the key government tasks at each of the annual central economic work conferences. At the conference in December 2013, the government clarified that capacity utilization in the steel, cement, aluminum, plate glass, and shipbuilding industries were all below 75%, and decided to bring capacity utilization back to normal. strengthening and better enforcing environmental and energy efficiency standards to eliminate some capacity. Although there is no consensus on the definition of excess capacity and how to measure it, historical data for the US (1967-2013), 17 Eurozone countries (1991-2013), Japan (1978-2013), Korea (1988-1998), Brazil (2005-2012) and Taipei,China (1981-2007) suggests that the normal capacity utilization rate is between 79% and 83%. A level of capacity utilization above 90% then implies capacity shortage while below 75% implies significant excess capacity. This policy brief is based on a consultant's report, entitled Knowledge Work on Excess Capacity in the People's Republic of China, published by the Asian Development Bank. Quarterly data from the People's Bank of China (PBOC) and the National Bureau of Statistics (NBS) shows that the PRC's manufacturing sector suffered from low capacity utilization (below 79%) during the second quarter (Q2) of 1992 and the first quarter (Q1) of 2002, and between Q4 2008 and Q4 2009, with average capacity utilization rate at 69.6% and 75.8%, respectively (Figure 1). Capacity utilization between Q1 2013 and Q1 2014 (Figure 1) stood at 80% on average for manufacturing in total, close to the minimum of the range that can be seen as normal. As there are gaps in NBS reporting about capacity utilization and the PBOC publishes its data with a time lag, we estimate capacity utilization with the growth rates of industrial value-added (VA) and the producer price index (PPI) as independent variables; this approach is based on experience in the US and 17 Eurozone countries. Industrial value-added growth, PPI, and capacity utilization are obviously closely correlated (Figure 2 and Figure 3). A regression analysis (Table 1) shows that the relation between capacity utilization, the growth of industrial value added, and producer price index in the PRC is robust. Using the equation below, we estimate that capacity utilization in Q4 2014 stood at 78.4%, or somewhat below the normal range. The analysis of disaggregated data, however, indicates that different sectors of manufacturing experienced excess capacity problems to different extents. According to data from the Chinese Entrepreneurs' Survey conducted by the Development and Research Center under the State Council, 19 out of total 29 sectors of manufacturing encountered significant excess capacity in 2012-2013. To find the sectors that face not only pronounced excess capacity but are also large enough to have a substantial impact on the economy, we calculated the simple average of the share of the number of enterprises, asset, revenue from principal business, and profit of the individual sectors to reflect their economic importance and used the Chinese Entrepreneurs' Survey results to assess excess capacity (Figure 4). It appears that ferrous metals, raw chemical materials and chemical products, non-metallic mineral products, general equipment, electrical machinery and equipment, and automobiles (in red) were the most problematic sectors in 2013. Given data constraints, we then calculated the capacity utilization rates of five subsectors under the above mentioned sectors, for which we have both output and capacity data, and found that four of them were characterized by pronounced excess capacity in 2012-2013: crude steel, cement, chemical fertilizers, and motor vehicles (Table 2). In summary, excess capacity in PRC's manufacturing as a whole was not as serious in 2012-2014 as it was in 1992-2002 and 2008-2009, but a number of economically important sectors and subsectors did suffer from pronounced excess capacity. Although excess capacity usually occurs when an economy faces deteriorating domestic and/or external demand in line with changes over the business cycle, its persistence in many of the PRC's manufacturing sectors for longer periods cannot be fully explained by demand side factors. In fact, the most important reason for excess capacity in PRC's manufacturing seems to be on the supply side, especially the continuously rapid growth in fixed asset investment. During 2002-2013, average annual growth of investment reached 19.7% in real terms, almost doubling real GDP growth (10.1%). As continuously increased investment expanded capacity in manufacturing and crowds out consumption, the relation between supply and demand deteriorated, resulting in overinvestment and eventually excess capacity. Several factors associated with government and market failure likely contributed to overinvestment and excess capacity in the PRC's manufacturing. First, decentralized investment decisions under incomplete information can help to explain excess capacity. The investment behavior of firms who share a consensus about the next promising industry can be described as “wave phenomenon.” Such consensus will trigger a wave of investment and eventually result in excess capacity. As the PRC maintained a rapid economic growth for quite a long time (e.g., average annual GDP growth of 9.9% in 1979-2008), strong infrastructure development demand attracted huge investment in steel, cement, and other construction materials. For instance, the investment in steel and iron grew by 45.9% year on year in 2002 and 89.2% in 2003. Domestic demand for steel and iron was increased by around 15%-20% per year in 2007-2008. As the number of investment projects was huge, target sectors were concentrated, and the sources of investment were decentralized, coordination among investors was very difficult, resulting in overinvestment and excess capacity in sectors such as steel, cement, plate glass, and aluminum. Second, under the current education and technology management system, enterprises in manufacturing have low incentives to upgrade their technology and products. During the high growth period before the global financial crisis, many producers grew overoptimistic about ever-increasing market demand. They did not invest sufficiently to move up in the value chain by increasing quality or developing new products. Instead, enterprises focused on expanding capacity at the low-end of the value chain. Third, the implementation of the huge stimulus package aimed at offsetting the impact of the global financial crisis in 2008-2009 encouraged local governments and enterprises to excessively increase production capacities. Although the government's massive CNY4 trillion stimulus aimed to boost investment in infrastructure and social housing, it was also used to support so-called "strategic" industries including steel, automobile, and shipbuilding, contributing to excess capacity in these sectors. For instance, capacity in the steel sector increased by 52% in 2009 alone. Similarly, the newly added number of production lines in plate glass in 2009-2012 was 40% of the total number of production lines added in the past 30 years. Fourth, under the traditional division of fiscal power between central and local governments and the promotion system for government officials, local governments have a strong motivation to promote economic growth through investment without considering social and environmental costs. That has led local governments to supply land at below-market prices, provide explicit or implicit guarantees for bank loans to selected enterprises and industries, or tolerate environmental damage caused by such enterprises and industries. This distorted enterprises' investment behavior and eventually caused overinvestment and excess capacity. Other input factors were also provided at below market rates, which is why the inadequate marketization of productive factors (e.g. land, water, electricity, natural gas, environment, bank loans, etc.) is frequently seen as one of the most important reasons for the persistent excess capacity in PRC. Fifth, the lack of a functional market entry and exit mechanism in the PRC is also influencing the elimination of excess capacity. To avoid unemployment and social instability, local governments are reluctant to implement the bankruptcy law and encourage enterprises' closure, mergers and acquisitions. 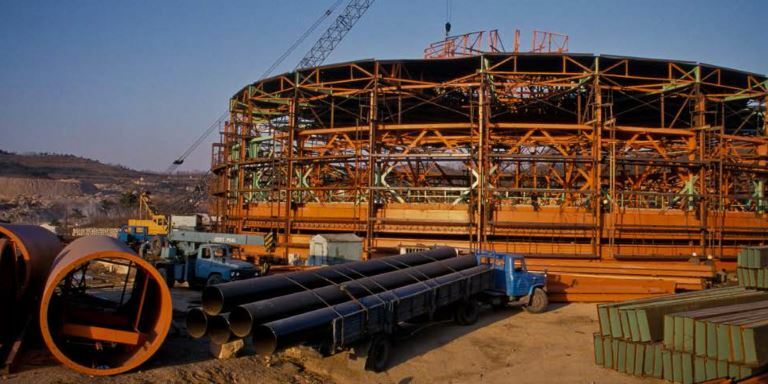 For instance, the number of employees in the steel and iron sector in Hebei province reached more than 600,000 in 2011. About 28% of them would have to be laid off if the out-of-date excess capacity was eliminated. How to deal with around 170,000 laid-off workers would be a great challenge to Hebei government. The reasons for excess capacity in PRC's manufacturing could also be illustrated as Figure 5. Source: Asian Development Bank staff. In general, government measures to address excess capacity in manufacturing have had some impact. However, the fact that excess capacity still persists, at least in some industries, indicates that more emphasis should be placed on how to eliminate undesired consequences of government intervention. To reduce the remaining excess capacity in the PRC's manufacturing sector, it is recommended to accelerate reforms by making better use of the market-mechanism in line with the decisions of the Third Plenary Session of the 18th Communist Party of China Central Committee. This includes rearranging fiscal relation between the central and local governments, and changing the promotion system of government officials. In line with the amended budget law, public expenditure should be more transparent and better monitored to avoid subsidy competition between local governments. The reforms on local government official promotion system, which focuses on GDP growth, should be speeded up to eliminate the strong motivation on the part of local governments to intervene in enterprises' investment. financial reform to improve the access of more competitive enterprises, including small and micro sized enterprises, to bank loans. More support should be given for enterprises to upgrade their products and move up the value chain, by strengthening the protection of intellectual property rights, intensifying vocational education and training, and increasing public spending on research and development, among others. Setting market entry standards should be based on indicators focusing more on social externalization such as environmental protection, energy efficiency, and quality control. To force enterprises with excess capacity to exit the market, the government should provide necessary social security and compensation, and (re-)training for laid-off employees. Asian Development Bank. 2015. Knowledge Work on Excess Capacity in the People's Republic of China: Consultant’s Report. Mandaluyong City. Biliang Hu is a professor of economics at Beijing Normal University and the Dean of the School of Economics and Resource Management. He is the President of Emerging Markets Institute, an international think tank that focuses on high level policy research and policy consulting for emerging market countries, and is jointly run by Washington DC based Emerging Markets Forum and Beijing Normal University. Jian Zhuang is a senior economics officer at ADB’s People's Republic of China (PRC) Resident Mission. He is a macroeconomic expert focusing on the Chinese economy. He has been contributing to the PRC chapters of the Asian Development Outlook, ADB’s annual flagship publication, and topical research since 2002.